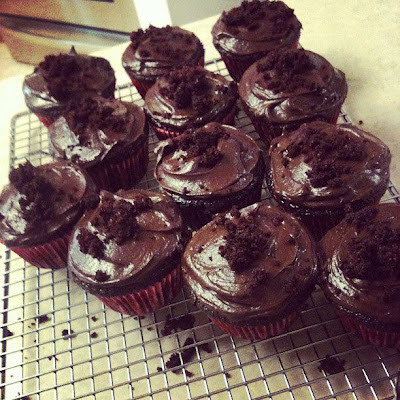 My recent, though really lifetime, obsession is cupcakes. 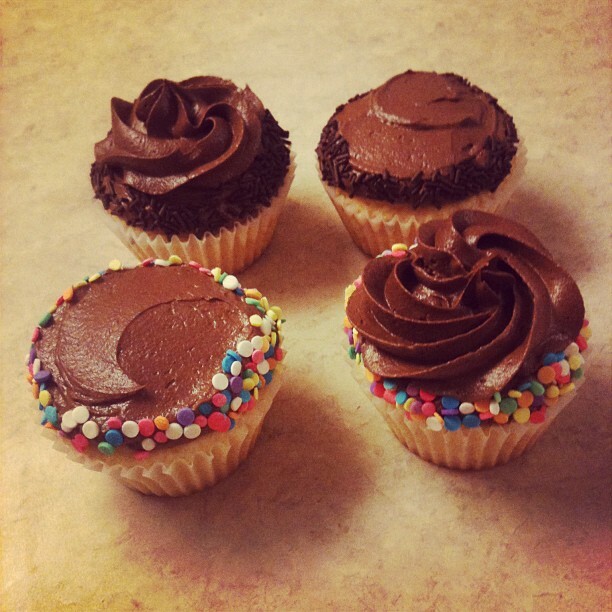 There is nothing quite as versatile, adorable, and perfect as a cupcake. They make me so happy! I've been posting quite a few pictures lately of my creations and have gotten a few questions on my techniques. I'll do 2 posts - one on tools and one on techniques. 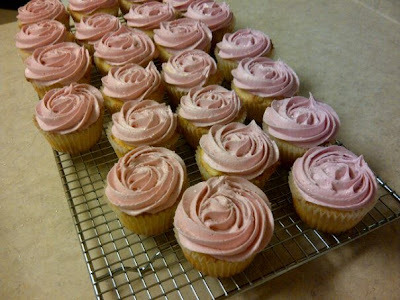 I am by no means an expert, I have merely spent countless hours running cupcake trials in my kitchen. 1. Piping bags: These are available in many sizes. I use a 16" (large) reusable bag. You can just as easily use disposable bags (easier clean-up) or a smaller size. The 16" holds enough icing to top 24 cupcakes without having to refill the bag (annoying). 2.1 Piping tips: There are 2 general sizes of tips available - small and large. The smaller ones are good for doing small details like writing letters while the large ones are good for getting big, pillowy swirls on top of your cupcakes. I generally use three which can be referred to in layman's terms as 'round', 'open star', and 'french'. The classic cupcake swirl can be created with the open star (Wilton 1M) tip. 2.2 Couplers: these are handy little plastic pieces that make it easy to change tips on your piping bag without having to stick your hand into all that icing. If you scroll about halfway down this post you'll see instructions on how to use one. 3. Colour: I use gel colour, not the liquid drops from the grocery store. Gel colour produces a much more vibrant colour and doesn't alter the consistency of your icing. A tiny bit goes a VERY long way. It can also produce a giant, stained, mess so use caution. They also come in a much wider variety of colours. I buy mine at Bulk Barn. There are starter kits with smaller jars that are a great way to test out a few colours. 4. Palette knife/offset spatula: don't ever use a butter knife to ice cupcakes again. A palatte knife provides a straight edge and is easier to use compared to a knife. Much easier to ice cakes with, too and gives a nice smooth finish. 5. Sprinkles: They provide a nice, whimsical finish to an already cute cupcake. I use festive sprinkles for holidays, multi coloured, and coarse coloured sugar for a sparkly finish. They aren't necessary but they do provided an added cute-factor. 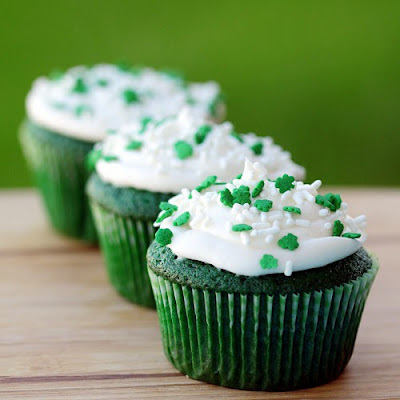 Try sprinkling them on top or rolling your cupcake in sprinkles on a small plate. Stay tuned for a 'techniques' post, coming soon! It is taking much willpower to stay out of the kitchen and not try to bake something. What has come over me? 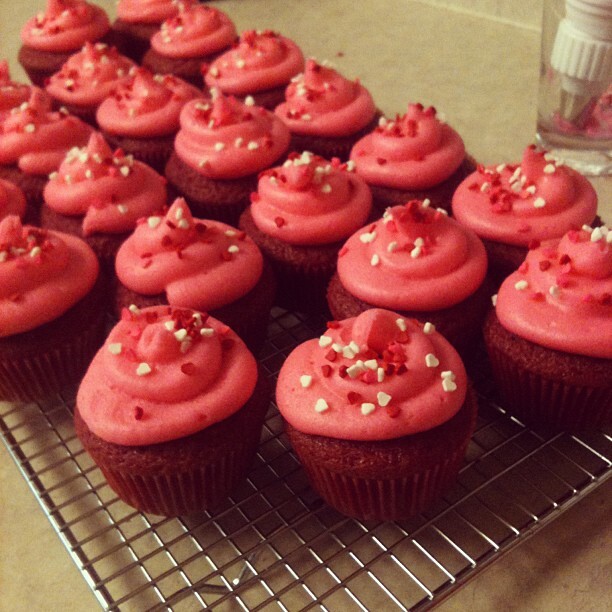 All I want to do is bake adorable, cute, delicious, cupcakes. Do people ever get sick of cupcakes? Should I stop telling you about them? I think twitter is feeling taken advantage of with my incessant twitter polls to determine what people are crushing on flavour-wise. I need to stop polling and start sharing. In related news, do you have a event coming up in which cupcakes would fit the theme? And really, what theme doesn't accomodate cupcakes. You name it, I'll bake it. For realsies. 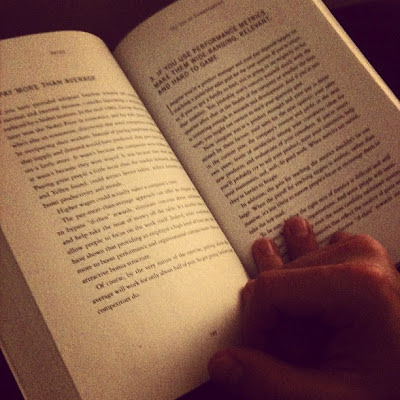 I really enjoyed writing this post for Valentine's Day so why not keep doing it! I don't usually need an excuse to bake but I'm sometimes lost for ideas so an upcoming holiday is great for inspiration. 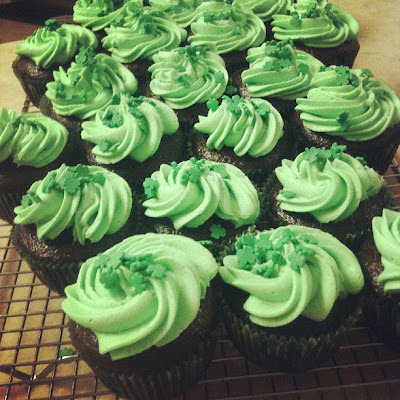 St Patrick's Day baking is basically a combo of green food colouring, mint flavour, and booze. What's not to love! 1. 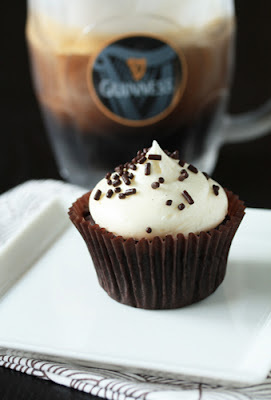 Guinness Cupcakes from My Baking Addiction. This is what I'll be making next week for RB to bring to work. I was happy that MBA had a recipe posted, love her stuff! 2. 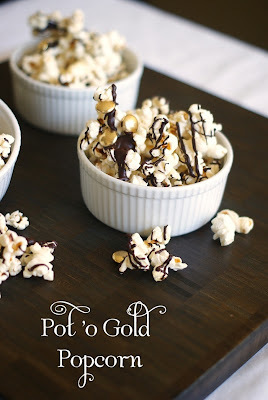 Pot o' Gold Popcorn from Bake at 350. It's popcorn, it's chocolate, it's shiny! What's not to love? Alternatively if you can't find gold chocolates, yellow Smarties (or M&Ms) would be cute, too! 3. 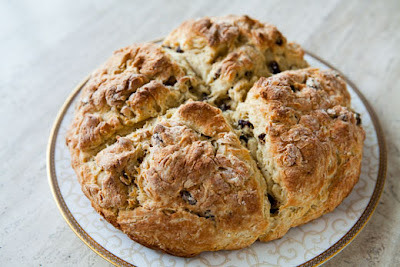 Irish Soda Bread from Simply Recipes. 4. GREEN Velvet Cake from Love from the Oven. These are awesome!! 5. 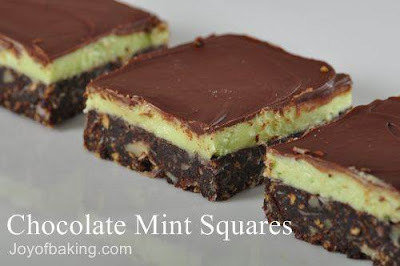 Chocolate Mint Squares from Joy of Baking. Like Namaimo bars but with mint! 6. 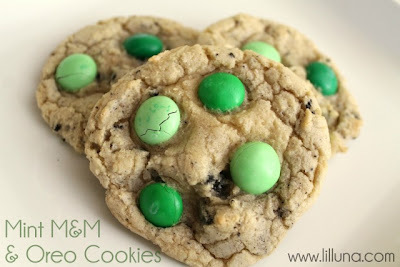 Mint M&M Oreo Cookies from Lil' Luna. 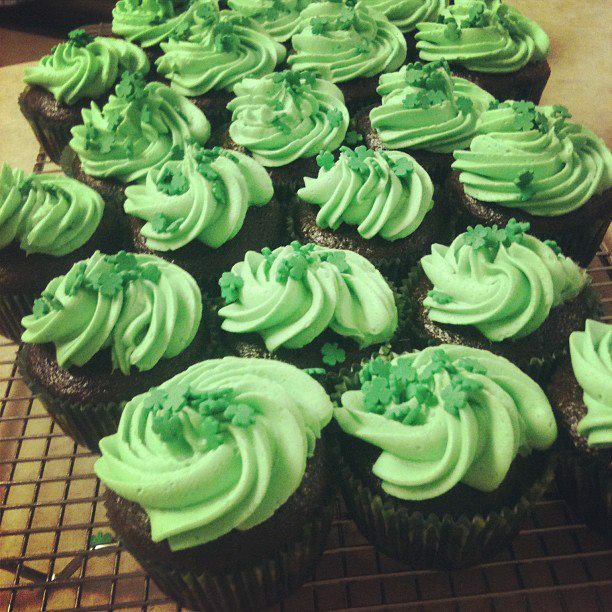 Are you baking anything fun for St Patrick's Day? 1. Parks & Recreation. I love a good sitcom and this one makes me laugh out loud. I want to BE Leslie Knope and live in Pawnee so I can have these friends. If you haven't seen it, start at the beginning. 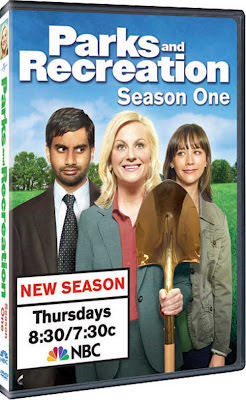 You'll be through season 1 by tomorrow! 2. David's Tea Mango Madness. 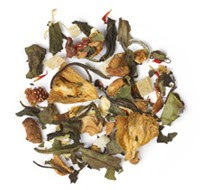 It's fruity and delightful and making my throat feel much better. 3. 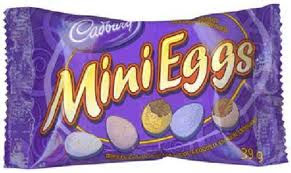 Cadbury Mini Eggs. What, you haven't eaten at least 1 kg of these puppies? Don't judge me! My superhuman immune system that has kept me healthy since June 2010 (yes, I searched my gcal for that) has failed me. I'll spare you the details but know that my Kleenex eating dog is on cloud 9. Thank goodness it's Kleenex and not some other sickness related by-product. Ew, I just grossed myself out. Let's relive happier, healthier times through some cheerful photos! Upon arrival we begin our trek across the bridge. And many hours and kilometres later we return, freezing, tired, and clearly on some kind of drugs given the day we've had. Day 2 we went to the top of ESB - beautiful view looking north up the East River. A quick drop in to see a game at MSG. Trying to justify hockey fights to someone just isn't worth it. They don't make sense. Ever. Also - added 2 teams to my Life List item #3! Stumbled upon Crumbs bakery, would be a hard sell to convince me there are better cupcakes anywhere on this earth. Walking home late at night meant empty streets and thus play time. Pro-tip: when taking a 'jump shot' bend your knees to make it look like you're jumping higher. View from top of 30 Rock - perfect day to go up! That's all folks, drafting a few posts on holiday baking ideas and tips for travelling with only carry-on... that is if I don't melodramatically pass away this afternoon. Don't cry for me, I don't have any extra Kleenex. You know that feeling when you have 100 things to do but you wish it were only 1 thing and that 1 thing were sleep? I know I'm preaching to the choir here and I know you're answer is 'YES, YES, a million times YES'. Yes, me too. drove to Buffalo, flew from there. Saved MEGABUX. Do this, it's much better than Pearson the alternative. Had our 7:15am flight delayed and then cancelled, placed on stand-by for 11:00am, confirmed for 3:30pm, contemplated driving, rescheduled on a different airline into a different airport for 9:15am. Crisis averted. Figured out the subway, sort of? Express routes are strange. Flight home through JFK - with temporary drains from the ceiling... for leaks... and pigeons walking through the terminal... flight delayed an hour... still made it home. Subway within NYC was super easy once I got the hang of it - had a pocket map on me that was very helpful. We stayed with friends for two nights and it was great - awesome to see Brooklyn & eat amazing giant bagels! We stayed at the Hilton New York at 6th & 53rd. We guessed on the location and it was perfect - right across from Rockafeller and easy walking to many attractions - great service, free upgrade, would recommend! We booked through Priceline and got about 40% off listed price. Brooklyn Bridge - forwards and backwards. Apparently it's being held together by duct tape. Financial District & south end - strangely quiet and non-busy, very small streets, could only get near the front end of the bull, took suggestive pictures anyway, view of Statue of Liberty from Battery Park, WTC memorial & new construction. Midtown area - Flatiron building, NYC Library (it's free to go in! ), Washington Square, Bryant Park, Union Square, Empire State Building, Grand Central Terminal. Staying in Brooklyn with friends from Camp Mighty - Chris & Jen could not have been better hosts! uh DUH, seeing everyone from Camp Mighty!!!... and introducing RB to the group. Grand Central Terminal - it's beautiful and crazy! Very busy. We saw a couple having wedding photos taken. The Wall Street Bull - (not actually on Wall Street), tourists were very politely lining up to have their photo taken with him, it was great! Top of the Rock - WAY better view compared to Empire State Building, much larger viewing deck, cheaper. The weather was better when we did this, too which was helpful. La Esquina grilled corn - crazy basement mexican lounge/restaurant. I asked the server for some snack suggestions and as an afterthought she added 'and the corn, I'll bring you some' as if we didn't have a choice. It was grilled on the cob, covered in butter and cheese, it tasted like popcorn. They also have a mega-normous list of tequilas. Empire State Building - we walked by it and there were no lines so we decided to go up. It was still very cool but Top of the Rock is better. Finding food - I realize in a city with so much awesome food there is also a ton of crappy food. I will plan this component better next time as it was hard to gauge where we would be and how far was reasonable to walk. We still ate great food but it could have been better. We didn't get into Central Park - If we were there in better weather I would have made more of an effort - will go next time. Bring better shoes. I feel stupid saying this but my shoe choices were poor. Next time, scrap the fashion and just wear sneakers - it's not worth the pain and the eye rolling judgement is unnoticeable. Shows - also didn't do this, maybe next time! Overall - it was a GREAT trip!! We packed many sights in. Next time I think I'll try for some more 'hidden gem' type attractions and more interesting food. I'll follow this up with some pictures! I'm back from NYC!! 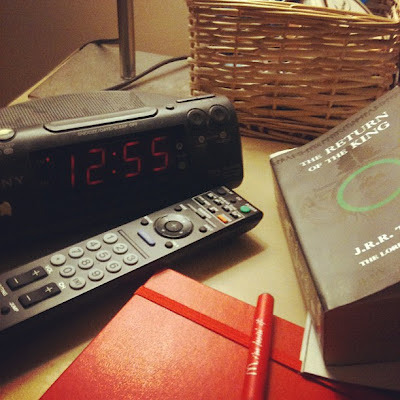 I need to post these final #febphotoaday pics to satisfy me need for completion. NYC posts & pics to follow this week!! Day 22 - Where you work. 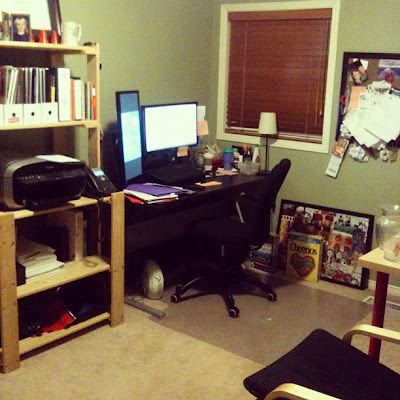 My home office! I keep it mega hot in here, probably not good for keeping me awake. Day 23 - my shoes. 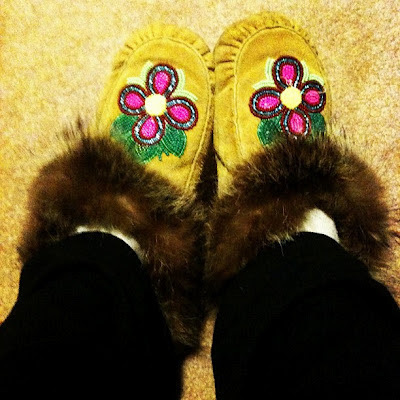 I wear these puppies everyday, they are soft & warm. Made in my home town, The Pas. Day 24 - Inside my bathroom cabinet. A strange one... and very personal! This is our impressive collection of medicine for all ailments. Note to self - baby proof this cabinet. 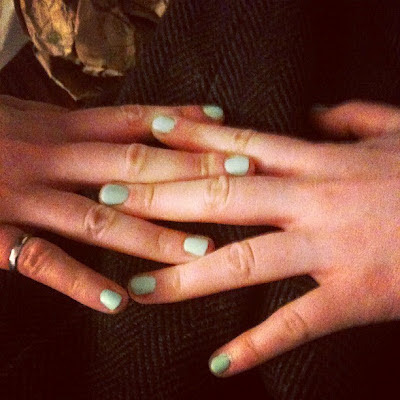 sporting a very cute sea-foam green colour. Day 27 - Something you ate. Spent Monday evening at the arena watching RB play hockey. 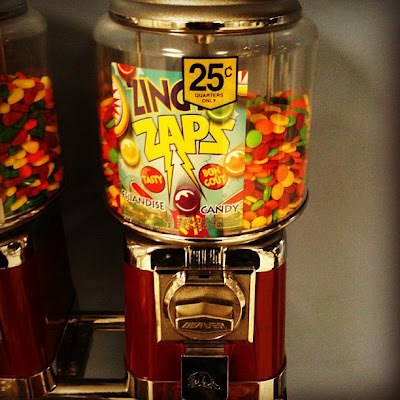 I naturally indulged in the local fare of vending machine candy. Day 28 - money. 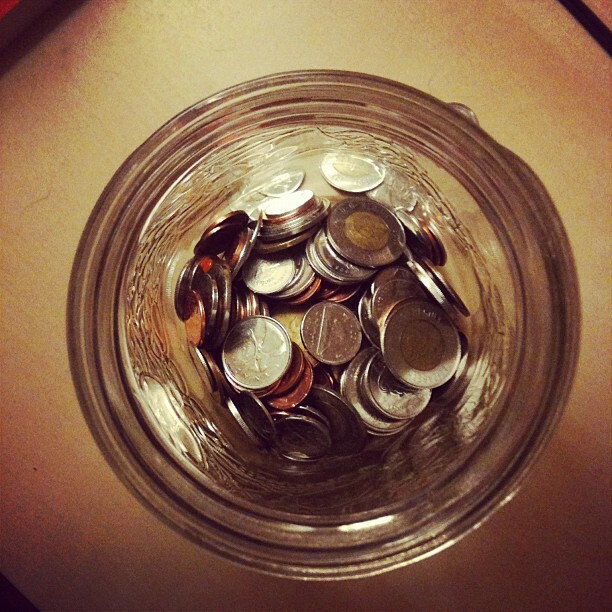 Rainy day change jar. Something that never would have existed when I was a student! Day 29 - Something you're listening to. RB, teaching me motivation development. That's it! NYC posts will be up very soon! 1. I succumbed to marketing pressures and sought out the Levi's Curve ID jeans that have been flying all over the internet lately. THEY ARE THE GREATEST EVERRRRRR. I have a whole post I'm drafting about them. They are THAT awesome. 2. Realization that I'm done working on group initiatives, I want to do my own thing. I've been working with groups for 8 years and it turns out I just want to spend my weekends refinishing second hand furniture, baking cupcakes, and smooshing puppy faces. I might go back to the group thing but probably not till the end of the summer. 4. 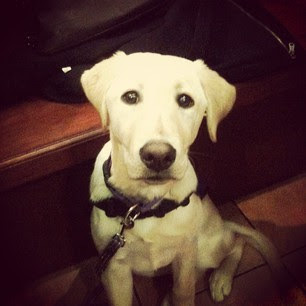 #febphotoaday challenge. I took my last picture yesterday and it was a lot of fun & interesting and makes you think more creatively about the experiences you encounter throughout the day. You should try it! March list is here. My posts are here, here, here, here, here, and here. One more post with the last 8 coming soon! How was your February? What did you do with your extra day?